After the success obtained at the last boatshow in Genoa with Azimut 68S, Stefano Righini was commissioned by the Azimut-Benetti boatyard to design the top model of the open range, the new Azimut 86S. The hull will be built with materials able to guarantee a strong yet lightweight structure, such as kevlar, carbon fibres and fibreglass. As far as the design is concerned, architect Righini, inspired by the winning style of the 68' model, designed on the 86S hull, above the waterline, the same symmetrical series of square portholes. The deckhouse will have the "shark's fin" windows that are a typical feature of the fly bridges of the other series built by the yard. The yacht has two decks; the main deck offers innovative solutions for improved comfort on board and is ideal for daytime activities. The small aft platform is one example: it may be used as sunbathing area but it also features an electrically powered tilting surface for tender launching and haulage. The latter, together with the hideaway gangway, is stored in a garage, accessible through the hatch in the transom. From the aft platform one can climb the stairs to the cockpit fitted with a dining table for eight and, to starboard, a cocktail cabinet with sink, fridge and barbecue. 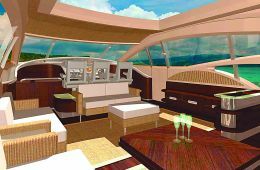 In the cockpit there is also the aft sundeck, whose forward end turns into a sofa offering seating for the dining table. To port there are a small L-shaped sofa and a coffee table and forward on the same deck there is another ample sundeck. Interior design has been entrusted to the architect Carlo Galeazzi, who has given an original touch to the interiors with contrasting colours and materials. The floors are in wengé wood with bordered carpet inserts, while pale hues have been chosen for fabrics with burgundy inserts. The salon has four small sofas and a folding coffee table, opposite which there are the cocktail cabinet and accessories for leisure time such as a plasma TV set, a stereo and DVD system. 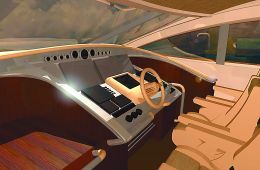 Forward of the salon there is the wheelhouse, fitted with the new generation of electronic navigation instruments. The sleeping area is on the lower deck. The owner's master stateroom is amidships, making the most of the full beam of the hull. It is fitted with a central queen-size bed illuminated by six ample portholes on both bulwarks, a study corner to port, a vanity to starboard and ensuite bathroom with Jacuzzi tub. The three double guest cabins are forward, two on the side with twin beds and one in the centre with a queen size bed and a study corner. The crew quarters are aft and include the galley, the eating area and two single cabins sharing the same bathroom with shower. The owner may choose from three types of transmission: standard V- drive, Arneson Drive and a Hamilton waterjet. According to the boatyard, the yacht fitted with a couple MTUs of 2,000 hp each and the Arneson Drive transmission can reach a maximum speed of 45 knots. For information contact: Azimut - Benetti; via M. Luther King 9/11; 10051 Avigliana (TO); website www.azimutyachts.net. Displacement at full load: 116,540 lbs.